This is another one of those quick and easy recipes that requires just 5 ingredients, sales tastes delicious and is just the thing for a quick lunch or a weeknight dinner. Just sear some chicken in olive oil, add onions, fire-roasted tomatoes and artichoke hearts and simmer for half an hour. 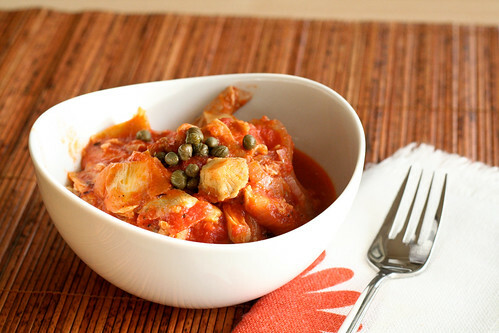 Top with some capers and you’ve got a nice, saucy chicken to top polenta, rice, baked potatoes, or pretty much anything. This is definitely going into the “lazy recipe file” to access whenever I don’t want to prep or stir anything. Heat a large, heavy pot over medium-high. Once it’s hot, heat the olive oil, then add the chicken. Sear on each side until golden, about 3 minutes per side. Add the tomatoes, onions, artichoke hearts and red pepper flakes and give everything a big stir. Reduce the heat to medium-low. Simmer for 20 – 30 minutes, or until the onions are transparent and the chicken is cooked through. Shred the chicken with two forks, or skip this step. Serve and top each portion with a few capers. I love simple recipes with few ingredients. Definitely a good weeknight meal! This recipe is similar to my artichoke chicken, but I never used thighs before. I made it the other night with the boneless, skinless thighs (added some kalamata olives and garlic) and it was a one hit wonder! Finally got around to making this tonight… great dish!